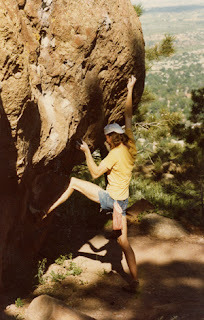 To remind visitors to this blog of what bouldering was about in the late 70s, here are a couple of photos, scanned from snapshots by Rob Candelaria. 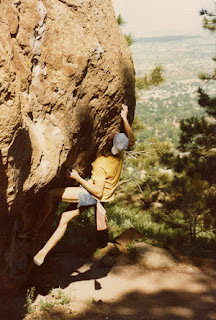 (Thanks, Rob) They show how Jim Holloway was able to reach the pocket from the ground at that time, making the setup for the crux a bit easier. However to move to the pocket from the sidepull on the UCT is relatively trivial and hence regardless of how Holloway started the problem, the hardest two moves are the same. My estimate for all three moves is around V12. 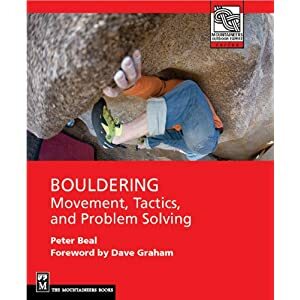 Having started climbing in the late 70s as a teenager, I definitely recall the homemade chalkbag, the EBs, and the sense that bouldering was something out of the mainstream. In my way, isolated in Maine, with only the occasional magazine, and borrowed copy of Master of Rock to inspire, I followed the same path and still try to. I hope this motivates people to learn more about the period and the people who set the standard. 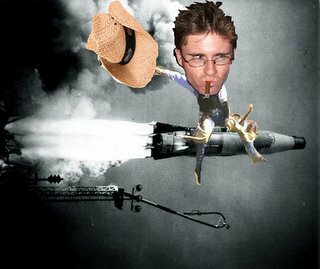 he was not overcome by the burn-out cycle of obsession and frustration, but rather kept that pot simmering until it was finally time to feast in celebration. proof positive that 'focus' is not limited to the immediate; it can be a definitive point on a distant horizon. slick sniper style in an environment of drive-by thugs.